The Medicare Supplement Plan M, this guide will take a look at what Medigap M does offer and help you decide if it’s the plan for you. You can compare rates and benefits of all the Medicare Supplement Plans in your area. Call us for a personal benefit explanation at 844-528-8688, there is never a fee for our services. Keep reading to see if the Medicare Supplement Plan M is right for you. All Medigap plans help reduce your out-of-pocket charges from copay, coinsurance, and deductibles. Medigap Plan M includes many of these benefits. The only charges it doesn’t help pay are the Part B deductible and excess charges. Plan M is unlike most other Medicare supplements that offer coverage for the Part A Deductible. You will be required to pay 50% of this deductible, which means that for 2018, you could pay up to $670 per benefit period for Part A expenses. While this cost sharing does reduce the monthly premium for Plan M compared to plans with similar benefits, it’s important for you to take a close look at your quotes to decide if the savings are enough to justify the extra risk. Who Is Medicare Supplement Plan M Best For? 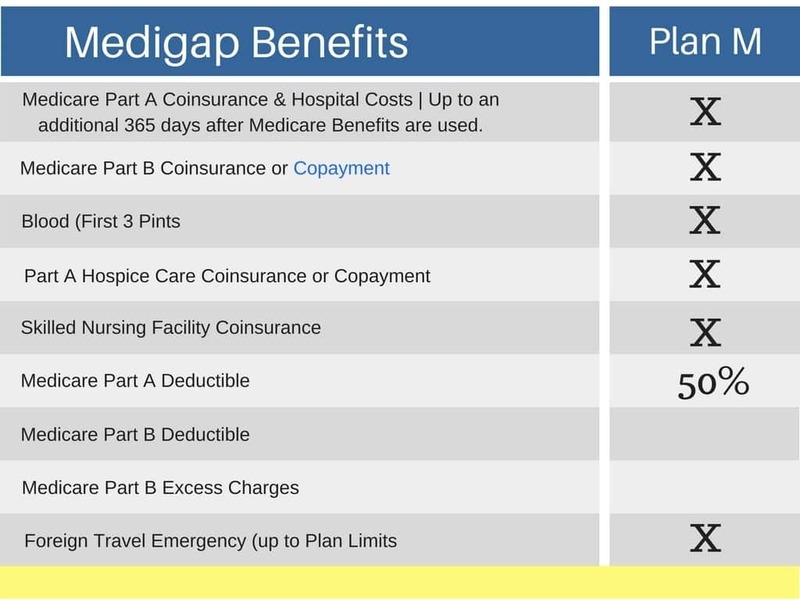 Medigap M is very similar to Plan D. The only difference in benefits is that Plan D covers all of the Part A deductible at the cost of a slightly higher monthly premium. Part A expenses are related to hospital stays and inpatient care. So, if you don’t predict you will need those types of services, or if you are willing to take the risk of paying more for them, then Plan M could be the right choice for you. Thinking About Enrolling in Medicare Supplement Plan M? Because individual insurance providers decide which Medigap plans to offer, it can often be difficult on your own to find a company offering Plan M. Historically, it just hasn’t been a popular choice so many providers don’t offer it. If you need help getting a quote for Plan M, or if you are just trying to decide which Medicare supplement is best for you, reach out to us today at 844-528-8688 or with our online contact form. We’ll assist you in choosing and enrolling in Medigap, and our services come at no additional charge to you.